Stephen F. Austin State University's Department of Geology will join the American Geosciences Institute in celebrating Earth Science Week with an event from 5 to 7 p.m. Tuesday, Oct. 16, on the third floor of the Miller Science Building. 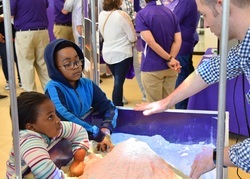 During an open house, guests will have the opportunity to use the augmented reality sand table. Photographer Paul Brandes, geology professor and current president of the Houston Gem and Mineral Society, will present "Epic Earth, The Art of Geology" at 6 p.m.
NACOGDOCHES, Texas - Stephen F. Austin State University's Department of Geology will join the American Geosciences Institute in celebrating Earth Science Week during an event from 5 to 7 p.m. Tuesday, Oct. 16, on the third floor of the Miller Science Building. For the open house event, visitors who have minerals, rocks or fossils they would like to have identified are encouraged to bring them for a free identification service. Guests also will have the opportunity to use an augmented reality sand table and create their own artwork. At 6 p.m., photographer Paul Brandes, geology professor at Lone Star College-Montgomery and current president of the Houston Gem and Mineral Society, will present "Epic Earth, The Art of Geology" in Miller Science, Room 335. "Our first Earth Science Week celebration is designed to increase awareness and help our community gain a better understanding of the planet we call home," said Dr. Wesley Brown, chair of the department. "The enthusiastic faculty and students are eager to open the doors of the Department of Geology to the community and answer all Earth science-related questions." This year's theme, "Earth as Inspiration," emphasizes artistic expression as a unique, powerful opportunity for geoscience education and understanding, according to Dr. Liane Stevens, assistant professor of geology. "The Earth is inspirational in so many ways - from children who are inspired to collect rocks, to those who travel to see grand scenery, to those who conduct research," Stevens said. "The faculty and students in the Department of Geology are excited to work together to share our inspiration with the public." For more information, contact Stevens at stevenslm@sfasu.edu or (936) 468-2024.